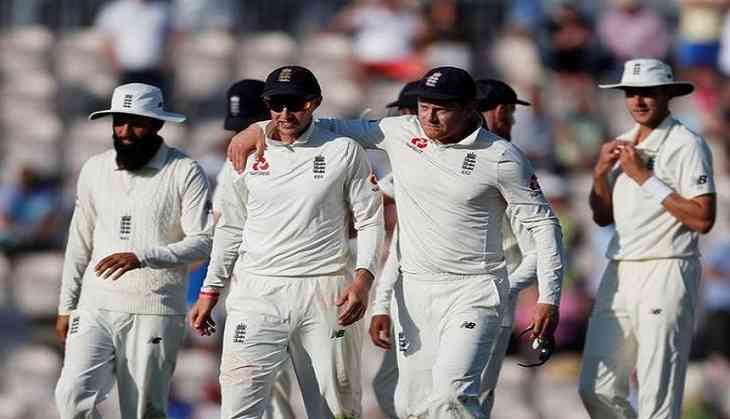 India went down in the fifth and final Test against England by 118 runs at the Oval on Tuesday. For India, KL Rahul ((149 off 224 balls) and Rishabh Pant's (114 off 146 balls) heroic resistance went in vain as sensational centuries from both the batsmen almost made it certain that India would go to salvage some lost pride and register an improbable win. However, England captain had the last laugh as his team clinched the series 4-1. But, England leg-spinner Adil Rashid dashed India's every hope with his lethal blows. Evoking memories of Shane Warne's 'Ball of the Century', the 30-year-old removed the well-set Rahul in the most exceptional manner, breaking a brilliant 204-run partnership in the process. Rashid also went on to removed Pant in his very next over, ensuring that England registered a thumping victory and also giving opener Alastair Cook a fitting farewell, who retired after the final test. Along with Cook, the series also ended in a memorable fashion for pacer James Anderson as he went on to become the highest wicket-taker in Test cricket among the pacers. Anderson surpassed Australian legend Glenn McGrath's tally of 563 wickets, taking the final wicket of the match as he dismissed Mohammad Shami for a duck, as India were bowled out for 345. However, India under Virat Kohli suffered a new low with the Oval Test loss as this is the first time since their 0-4 defeat against Australia in 1991-92. For Indian skipper Virat Kohli, he ended up as the highest run scorer by a comfortable margin. In 5 Test, Kohli scored 593 runs at an average of 59.30 including two centuries. While James Anderson went on to become the highest wicket-taker in the series as he claimed 24 wickets.